New Disney Animals… with Clothes! Still working our way through San Diego Comic Con discoveries, but now we have this BIG news from Disney’s D23 Expo to talk about. During the opening day presentation on upcoming animated movies (including Disney’s Frozen and Pixar’s The Good Dinosaur), Disney made an announcement about a new animated film called Zootopia, which is scheduled for release in 2016. Check out this summary from Slash Film: “Tangled director Byron Howard will direct the film from a script by Jared Bush. They’ve been working for the last year and a half on the project, spurred in in part by a love of the Disney Robin Hood feature. Howard wanted to do a film with animals in clothing. They hope to continue ‘Disney’s amazing legacy of animal-based animated films’… We’ve seen movies featuring animals in the natural world, and in the human world, but we’ve never seen animals in a modern world designed by animals. What would animals do differently than humans would? So the filmmakers talked to experts, from anthropologists to safari guides to imagineers as they began to design an animal civilization which is ‘distinctly animal’.” Are you excited yet? We are! Here’s the plot: “In the animal city of Zootopia, a fast-talking fox who’s trying to make it big goes on the run when he’s framed for a crime he didn’t commit. 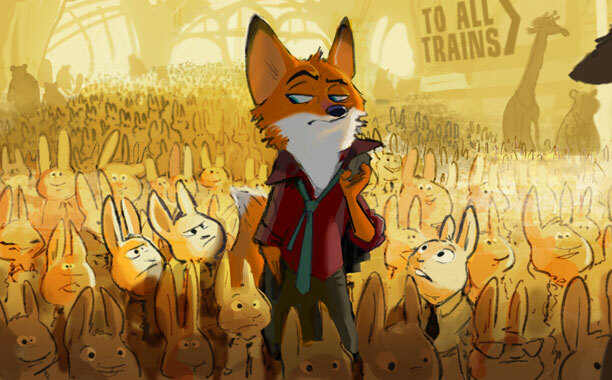 Zootopia’s top cop, a self-righteous rabbit, is hot on his tail, but when both become targets of a conspiracy, they’re forced to team up and discover even natural enemies can become best friends.” Check out the rest at Slash Film. And see you in 2016! This sounds like Furry Crack. (Ooh. not a wholesome sounding phrase). This is awesome news. I dunno, sounds kinda "hole"some to me. Such a bummer this is not going to be in traditional 2D. After reading the synopsis about "Zootobia", and just coming back from seeing "2 Guns", the only thing I can say is "deja vu!" (well... "unimaginative ripoff" too, but...). But it will be released in 2016, so three years will make the story concept seem fresh. And 3D?. Go 3D, but follow the pseudo-2D/3D mesh formula of "Paperman" if you must. All the heart and cuteness we see in the hand draw concept sketches so far will be lost on a full 3D transition. Unfortunately, reading about this first on Cartoon Brew, then reading the comments, soured me a bit to the synopsis, or to the fact that Disney is doing it.